Woodstock (population 20,151) is located in far northeastern Illinois on Illinois Route 120 at Illinois Route 47 in McHenry County. Woodstock is a far western suburb of Chicago. The town was incorporated in the latter 1800's after well-rounded prosperation. The history of the Todd Seminary dates back to 1873 and was founded by the Reverend Richard K. Todd. The grounds, which had at least ten buildings during the time of it's existance, were located in a triangular block in Woodstock along McHenry and Seminary Streets. The buildings were: Wallingford Hall, Clover Hall, Rogers Hall, Grace Hall, the Gymnasium, the Headmasters Cottage, West Hall, Cozy Hall and North Hall. 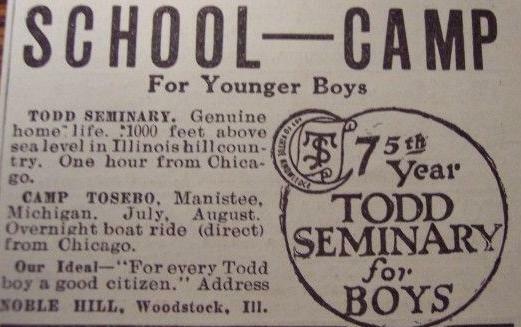 The Seminary welcomed boys from ages 6 to 18 from all over the country. It had at least 110 students from 17 different states in the 1920's with ten grades being taught. The education was based on those principles given by the Presbyterian Parish of Woodstock. Noble Hill came to the Seminary in 1888 and purchased it in 1892, the year renovations were made. Noble ran the Seminary until 1929, when his son Roger took over. "Use of cards, gambling, tobbaco, bad language, firearms, reading of trashy books (et al The Catcher in the Rye) and papers, contracting debts, going off-grounds, going downtown without being accompanied with a teacher, leaving after evening prayers are prohibited." Todd Seminary prospered for 81 years, closing down in 1954 and torn down some years later. Grace Hall, a former building that was a part of the school, is still standing; however, plans have been made to raze the building. A community movement is hoping to preserve the structure. 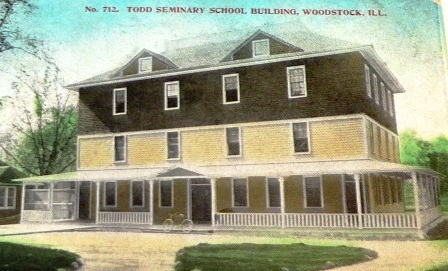 A nursing home now occupies the location where Todd Seminary once stood. There is miniscule information out there about the existance of athletics and other extra-curriculars at Todd Seminary. We do know that they had an Athletics Director. Tony Roskie was the A.D. at Todd Seminary before leaving for Woodstock High School, where he was A.D. for a number of years. 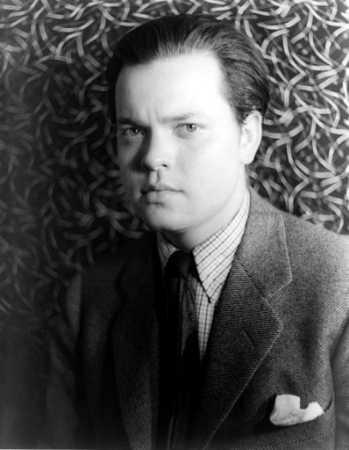 *Orson Welles, Class of 1931 - Welles was born in Kenosha, Wisconsin in 1915, and lived in Grand Detour, Illinois (along the Rock River northeast of Dixon) at one point in his early life. Welles attended Todd Seminary from age 9 to 16 and acted in numerous plays. Welles would go on to become one of America's most prolific men, having acted on radio, television, movies and even wrote a few books. Welles' most memorable roles were playing lead roles in Citizen Kane (1941), Journey Into Fear (1942), and The Stranger (1946). He is even more noted for his shocking radio broadcast in "The War of the Worlds" in 1938 for CBS where listeners actually believed his words that aliens were invading Earth. Welles died on October 11, 1985 at the age of 70. *Harris Eberhart, Class of 1909 - Graduated with honors at Todd Seminary, attending four years from 1905-1909. In the summer of 1909 Eberhart, a native of Mishawaka, Indiana, attended YMCA Summer Camp at Corey Lake, near South Bend. Sadly, he and a friend from the Seminary were coming back home from the camp and died tragically in a train crash. Eberhart left behind plans for a permanent campsite at Corey Lake, which today is known as Camp Eberhart.